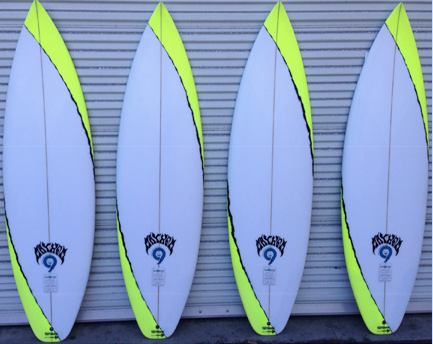 The “Exacta Series” kicks off with Taj Burrow’s, Hurley Pro winning, 5’9 x 18.38 x 2.20 Beach Buggy replicas. Each limited edition board is signed, numbered, and shaped from the exact file of his 2013 WCT victory board. Glassed ultralight with “S” glass and featuring a cleaned up version of TB’s self Inflicted air spray. TAJ vs TRESTLES from Lost Enterprises on Vimeo. Next up in our signed, numbered, limited edition “Exacta” series of pro boards is Julian Wilson’s 5’10” x 18.75” x 2.25” V2 Short board. This is the board that he rode in the 2013 US Open of Surfing in what many were saying was the best surfing of the entire event. This board is glassed with ultralight team “S” glass and features Julian’s signature “X” air spray. Only a few of these were made so get one while you can. Take a look at the video to see what kind of surfing people were so excited to see. JULIAN V2 SHORTBOARD from Lost Enterprises on Vimeo.